The day started off cloudy with light drizzle and rain showers in the area. 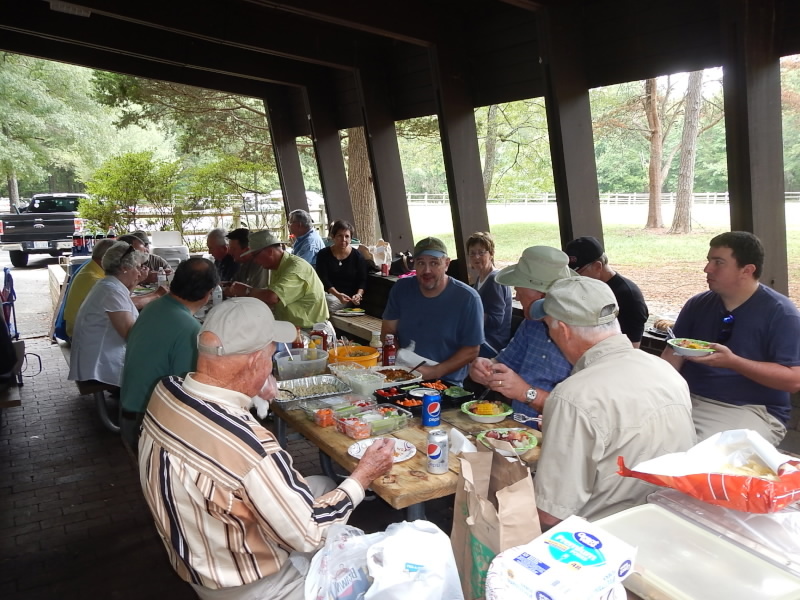 However, that didn’t stop these dedicated fly fishers from coming out to the fall picnic. 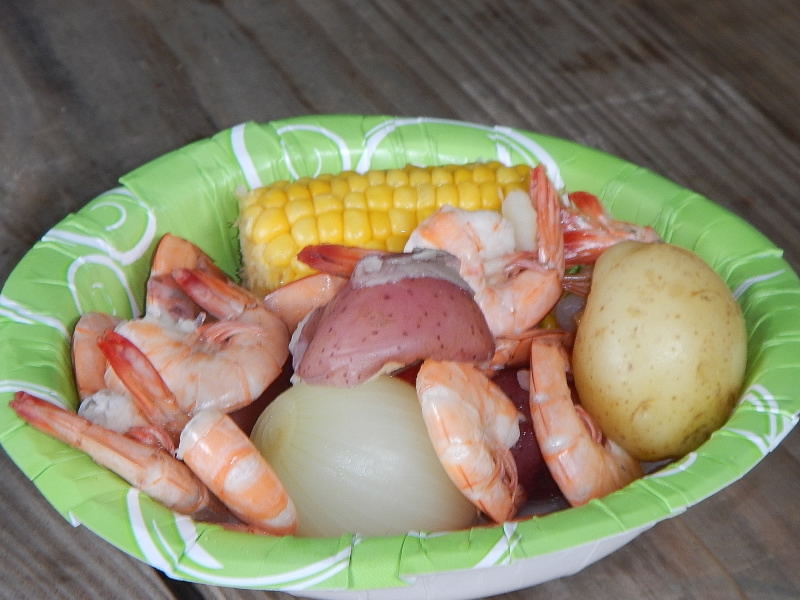 As you can see from the pictures, Bob Thomas cooked up a large pot of delicious low country boil. 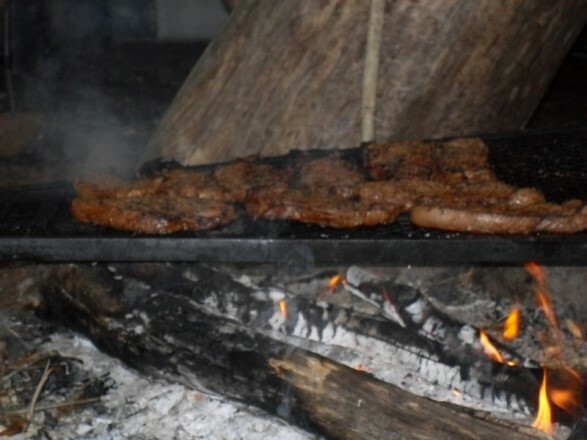 For those that didn’t care for that type of food, there were hamburgers and hot dogs. 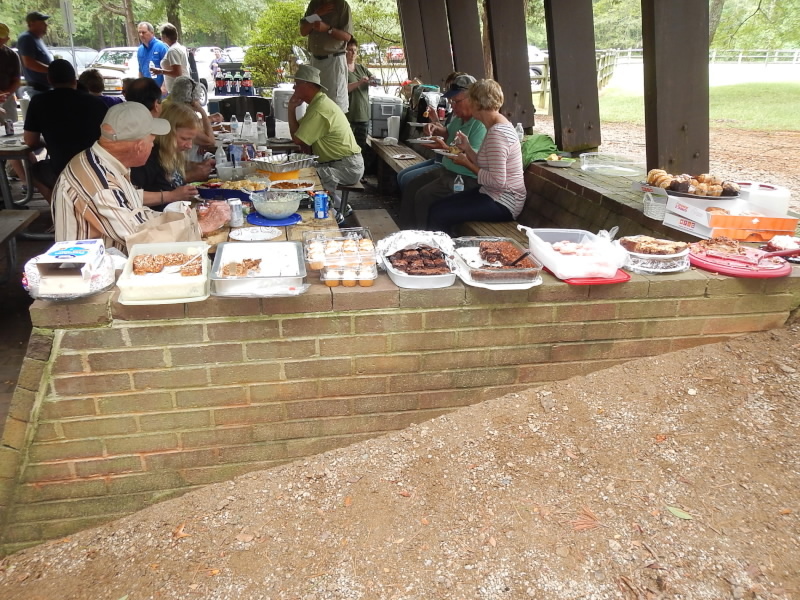 The potluck side dishes were fantastic along with plenty of deserts to satisfy the sweet tooth. 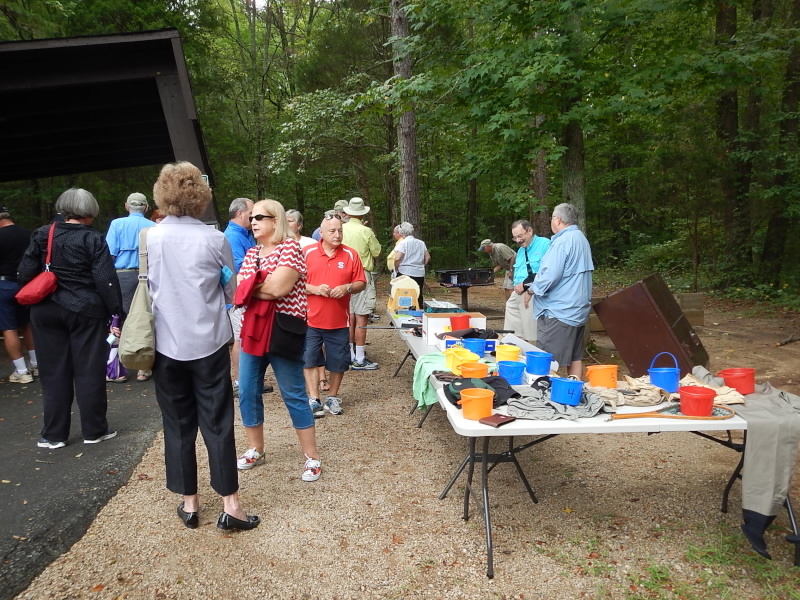 Gary Faulk presented a well organized raffle along with a lot of really good and useful items. Fortunately the rain held off so those that wanted to test or fine tune their casting skills with certified casting instructor Jack Cummings, could do so in the large field next to the pavilion. 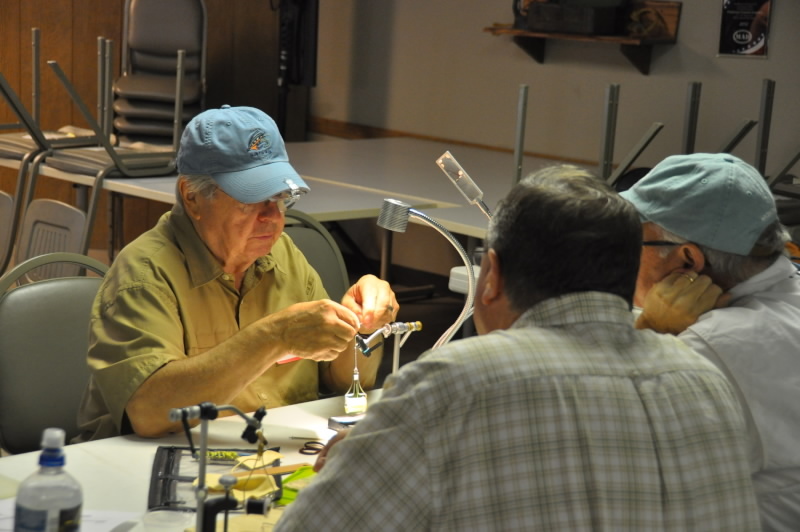 We had three tables set up for different levels of fly tying with Herb Broegmann, Gary Jones, and David MacBurnie as instructors along with Jack Cummings as a floating helper. 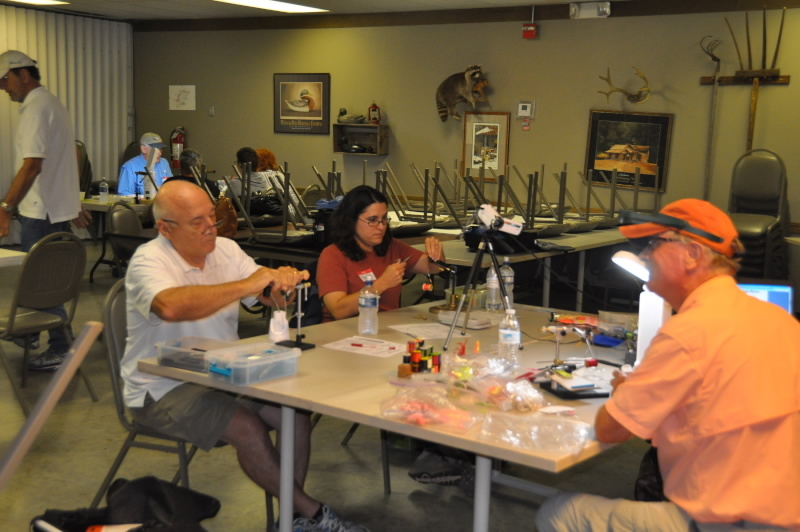 All had a great time tying flies for delayed harvest (DH) fishing. 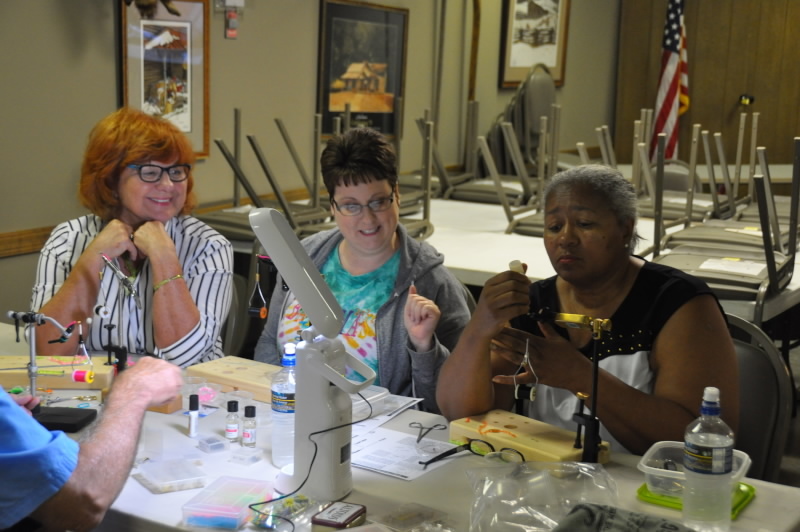 Some of the flies tied were the Egg, Sham-Wow & Squirmy Wormy patterns. 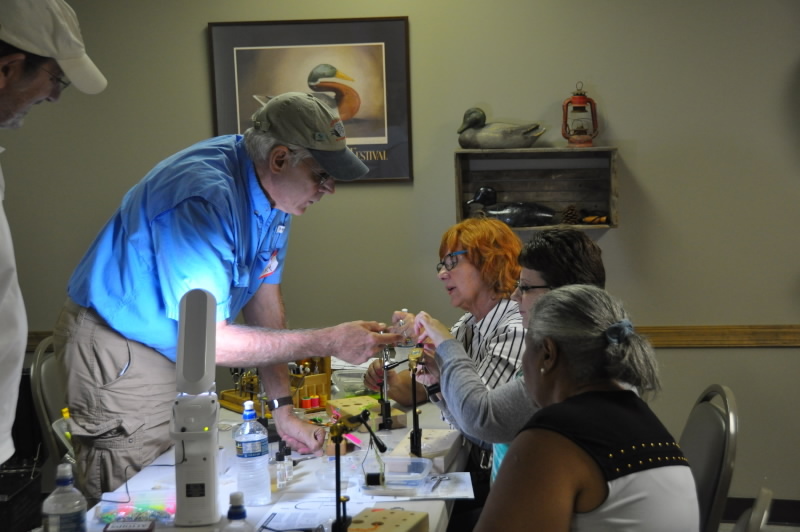 Gary had the girls tying patterns of his famous gummy tail attractors. 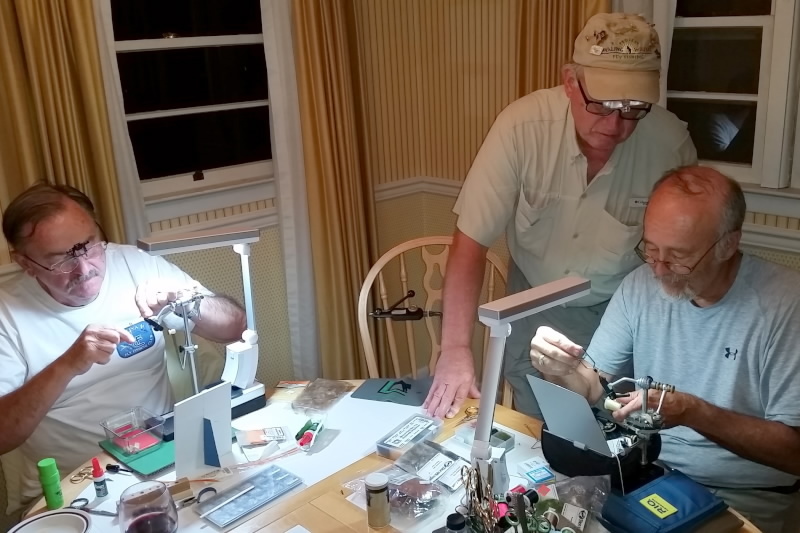 All took home several flies that can be used on our fall outing on Wilson Creek on October 10th. We hope to see you all there. 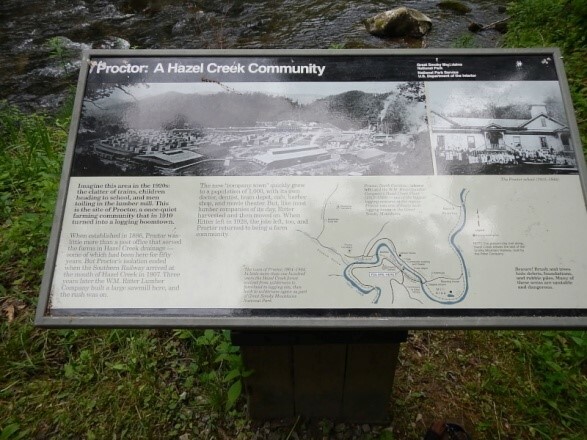 Six of the CFFC members traveled to East Tennessee August 6-9 to fish the South Holston and Watauga Rivers. 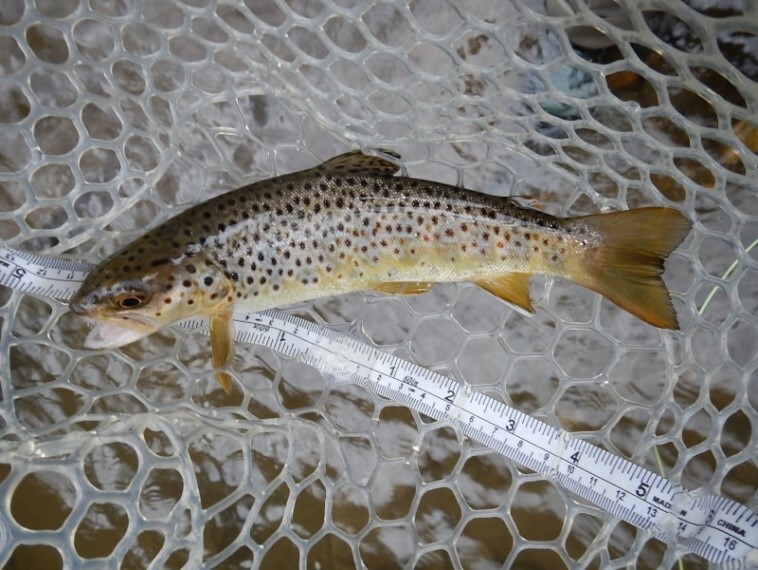 Water levels are still high in the lakes and the dam release schedules were less than ideal for wade fishing. 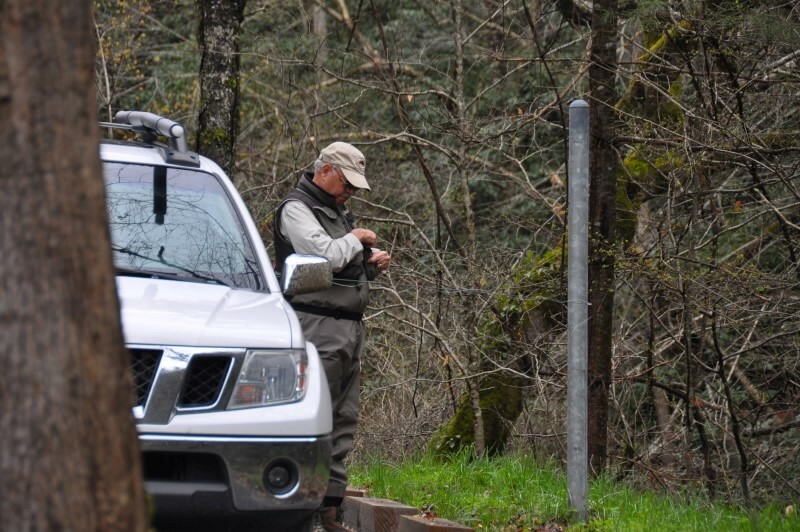 However, we were able to get plenty of fishable hours in on both rivers by closely monitoring the water releases. 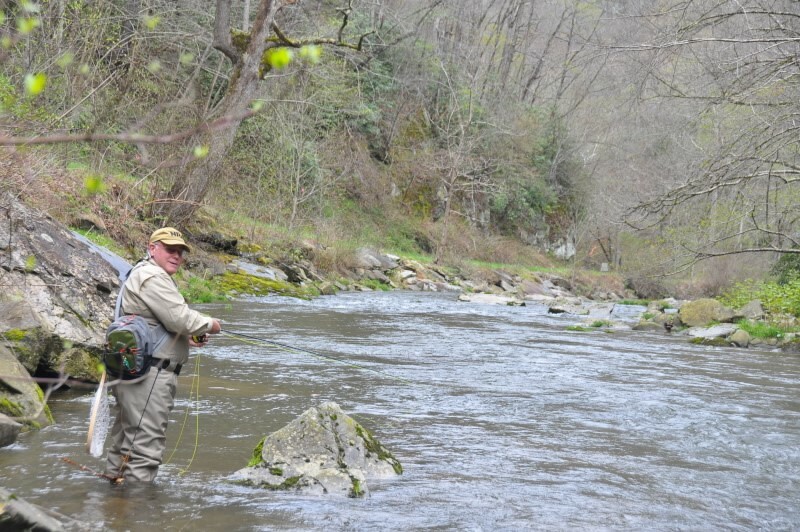 We were able to fish the South Holston all day on Saturday. 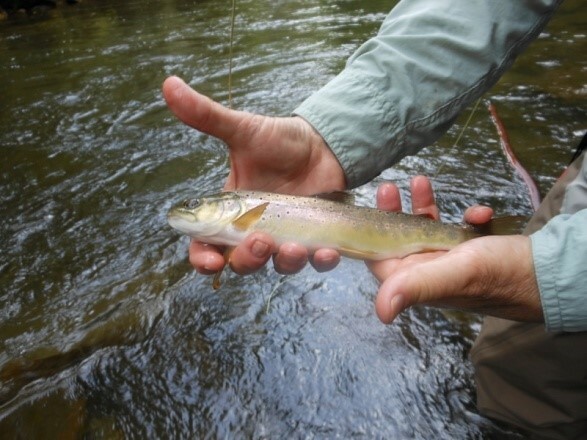 The sulphur hatch was light but steady, especially on Saturday. Dries, emergers, and midges worked well. 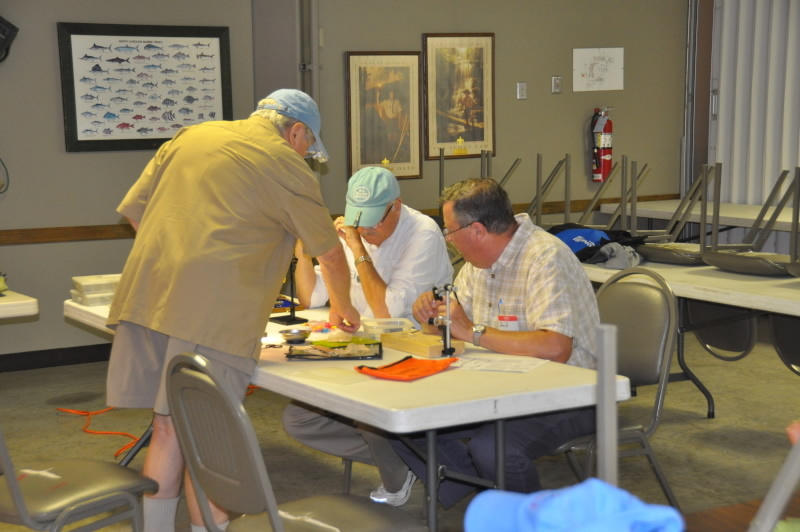 Most everyone caught fish, from a few to some good numbers. 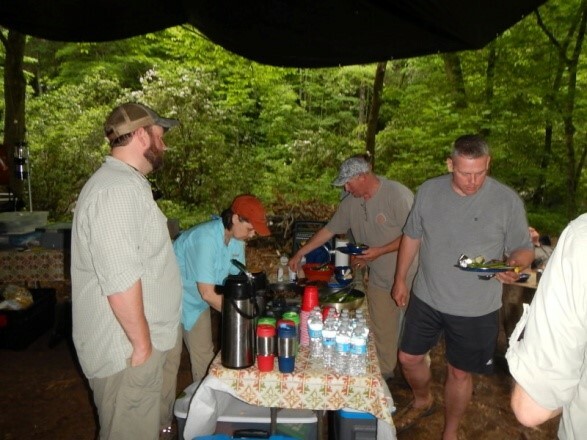 As usual on these trips, the attendee provided dinners and breakfasts were outstanding. We eat well. Evening lying and tying was fun. 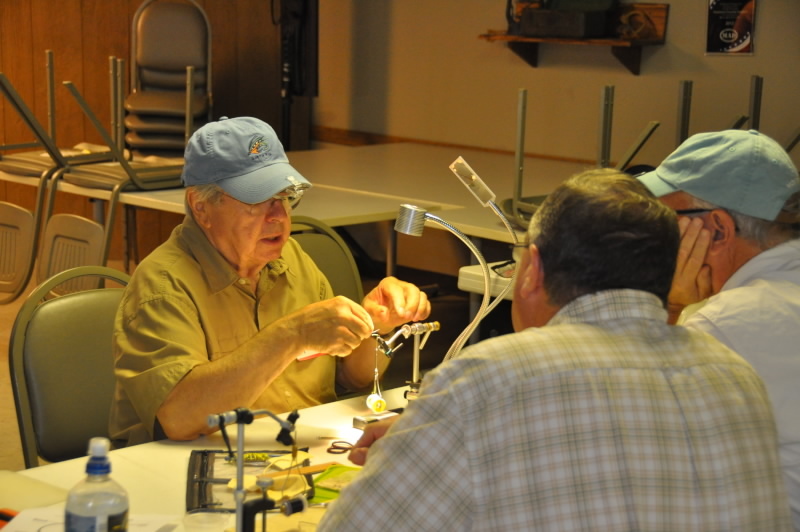 We have very interesting members from new fly fishers to very experienced. 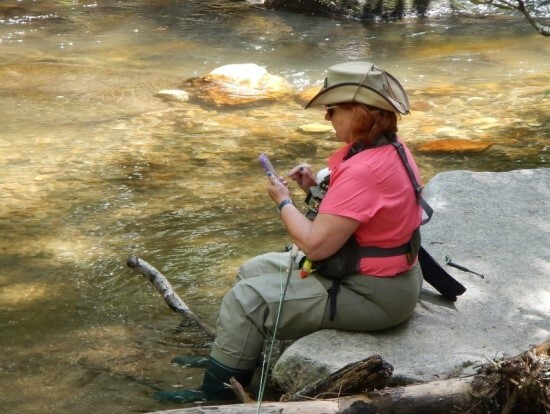 It is great to hear their stories of where each has fished, varied kinds of fish sought, and some personal background into their families and careers. We also watched some very good videos on fishing tactics and bug life. 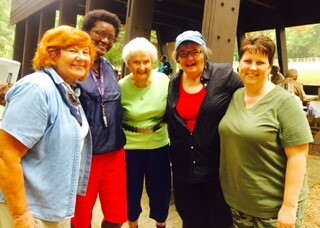 We all met at the Frank Liske Park this morning at 9:00. What a well kept, clean park with a gorgeous pond. Gary Jones couldn’t have picked a better place for our casting instruction. 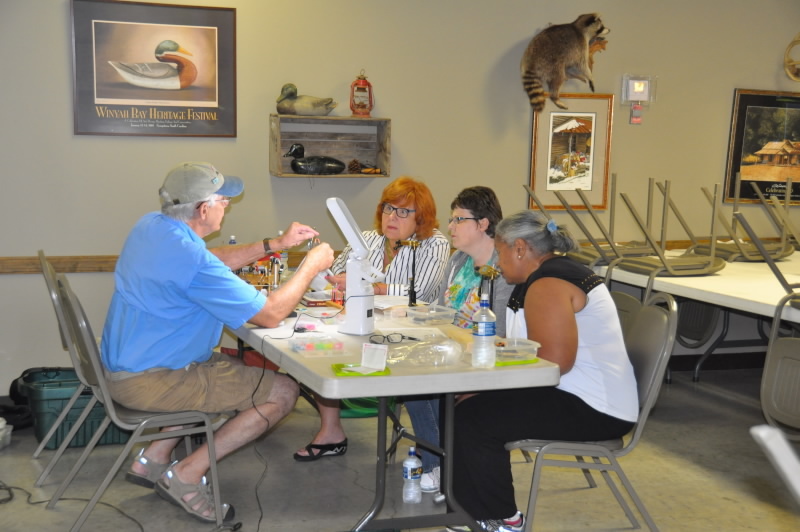 Gary had us test our casting abilities and then assigned persons to either the beginner group or intermediate group. Three instructors/helpers went with the beginner group and three instructors/helpers went with the intermediate group. 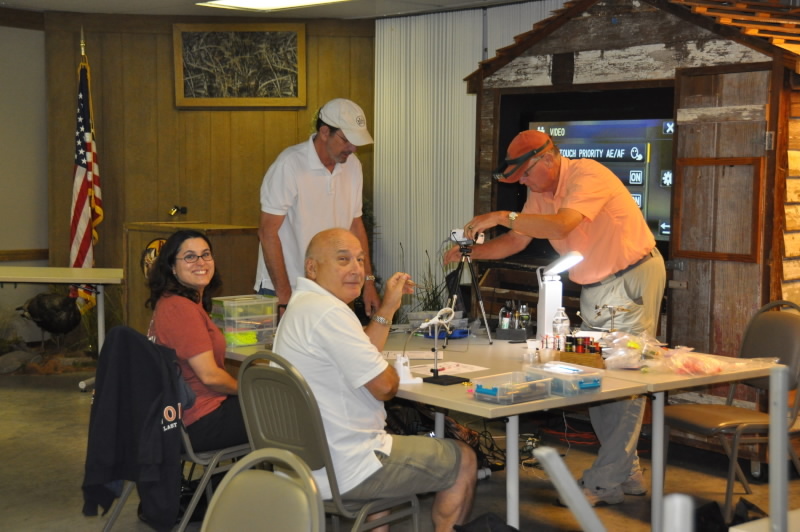 Everyone had a great time and showed a marked improvement with their casting. If anyone wants to improve their casting ability, this is definitely the class for you. Everyone today had a very positive experience and look forward to the next class. 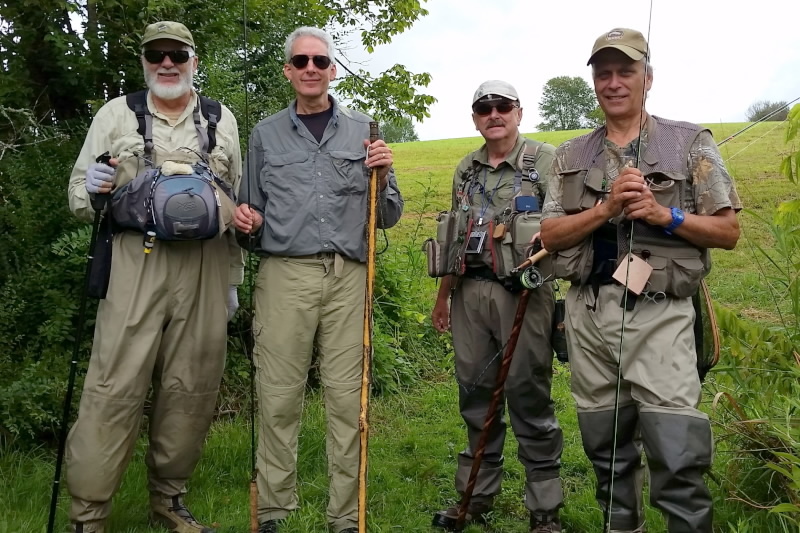 Five members of the CFFC ventured to Bluff City, Tennessee, for our July trout fishing outing on the South Holston River. 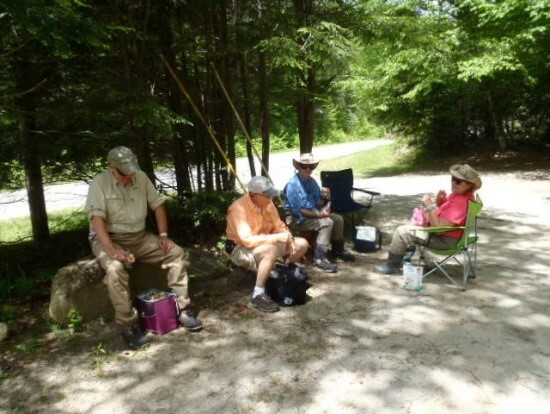 This was the first visit to this area by two of our attendees and the very first fly fishing trip for one of the attendees. Unfortunately, the TVA was releasing water from the Holston Dam 24 hours each day on Thursday and Friday. 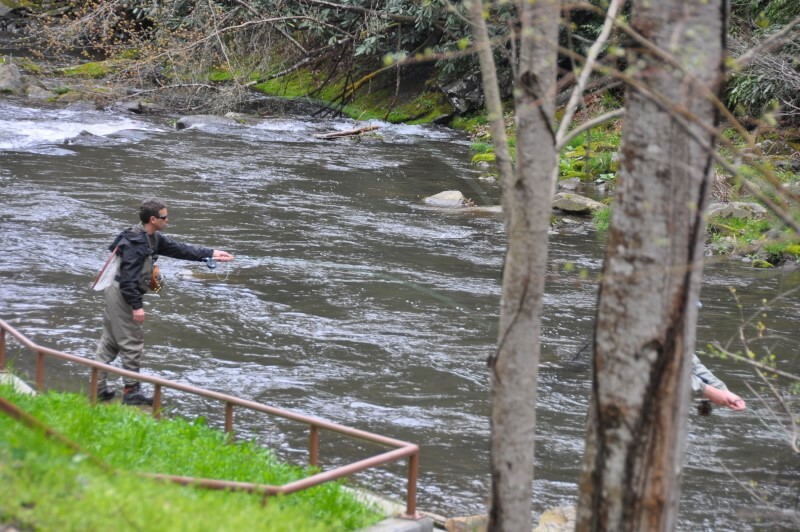 A small window was available for fishing one stretch of the river early Saturday morning until about 9:30 AM. 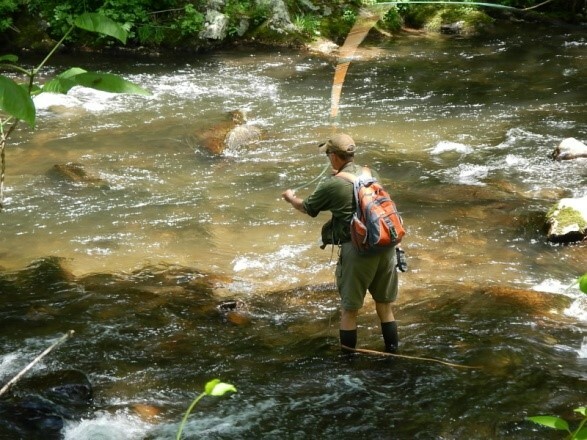 The release schedule did not eliminate our fishing opportunities, however. 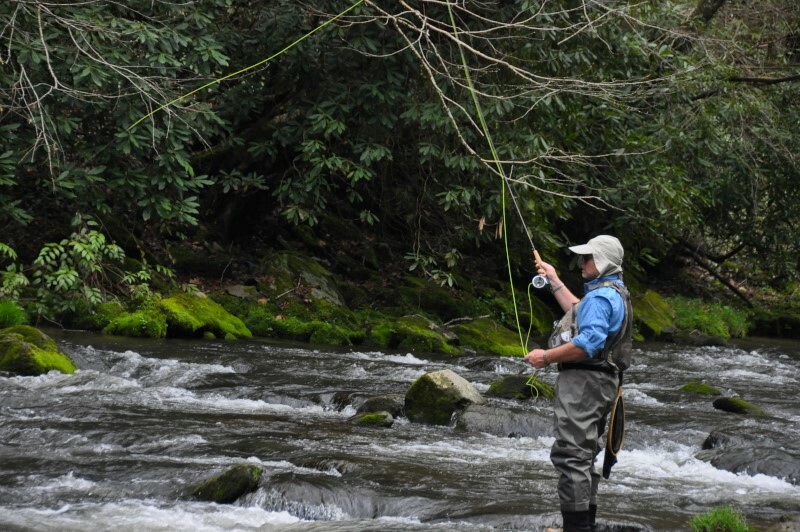 There are a number of streams to fish in this area and we elected to fish the Watauga River in Elizabethton. 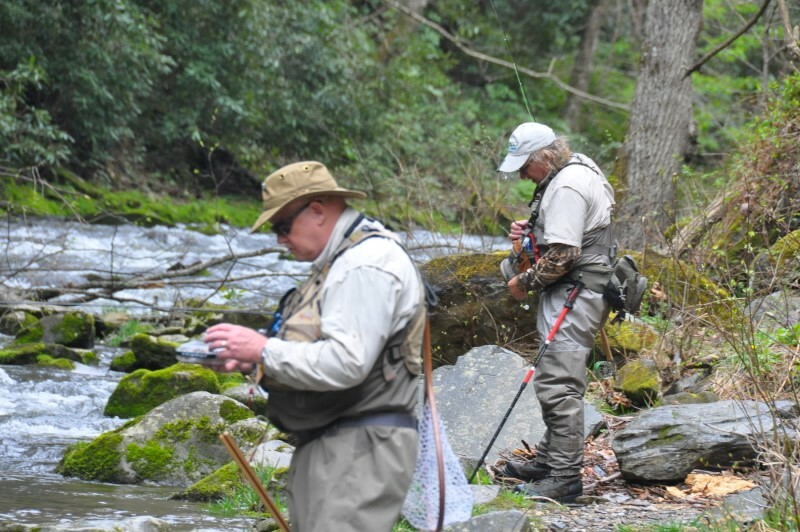 The water release schedule was more accommodating and provided us with fishing opportunities for the better part of Friday and Saturday. 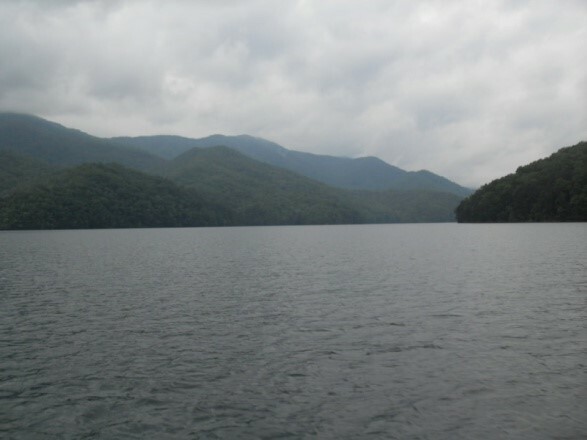 The weather was good and fishing was pretty good. All of the trout caught were rainbows. 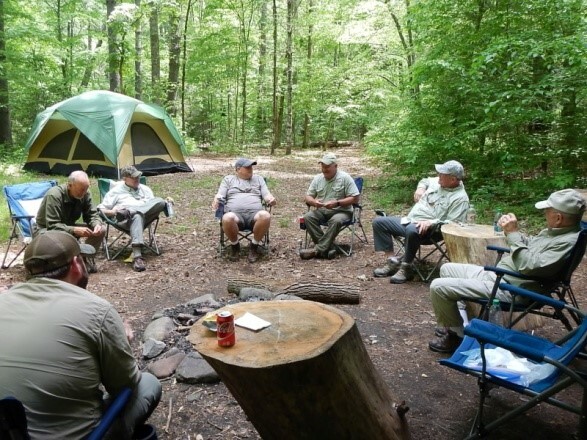 All of the attendees enjoyed the comradery, good food, fly tying, endless stories of fishing and other outdoor adventures and the opportunity to get some fishing in on what was new water to everyone. 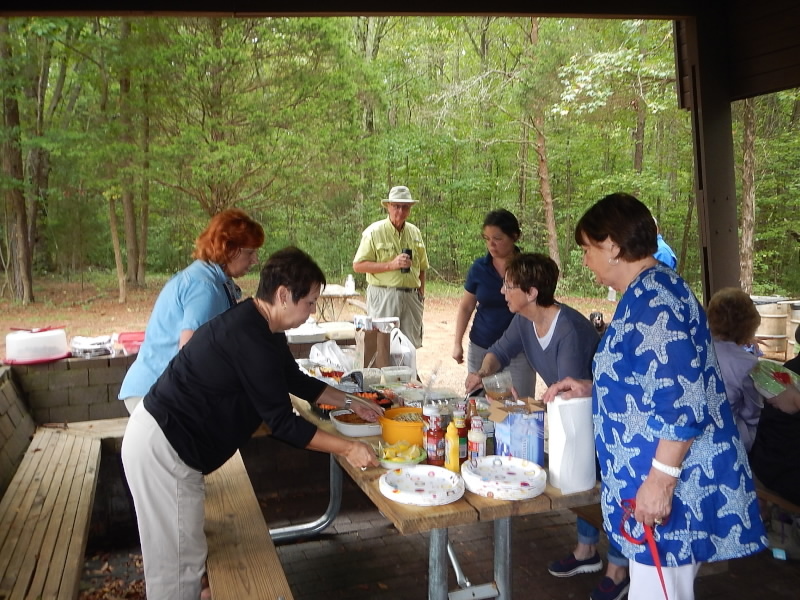 There were nine CFFC members that attended the pre-Mothers Day outing in Stone Mountain. 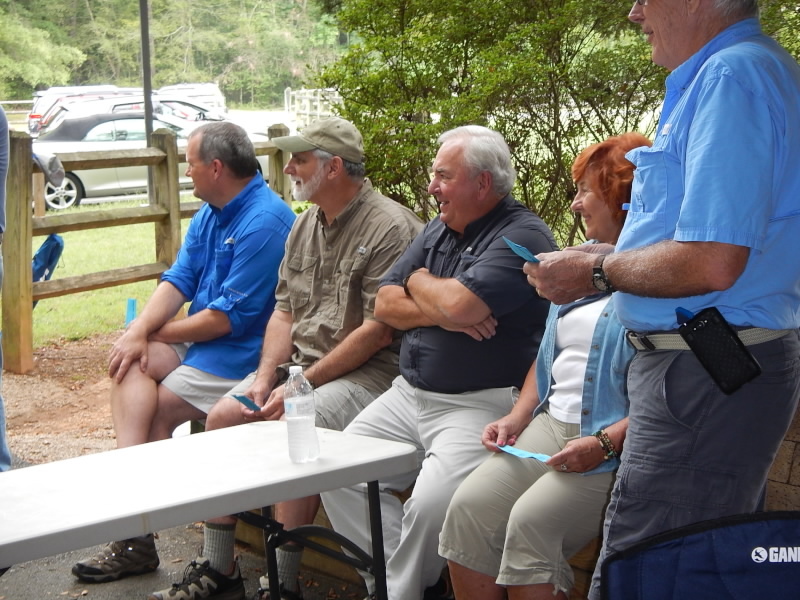 Attending and catching fish were Todd Bassinger, Mark Farrell, Linda Hickle, Roz Hollifield, Dave MacBernie, Jim Mackey, Rick Meeks, John Personette and Bob Talluto. It was a perfect day with loads of sunshine and temperatures in the upper 70s. Most all caught fish that day but I didn’t hear of any lunkers being caught. 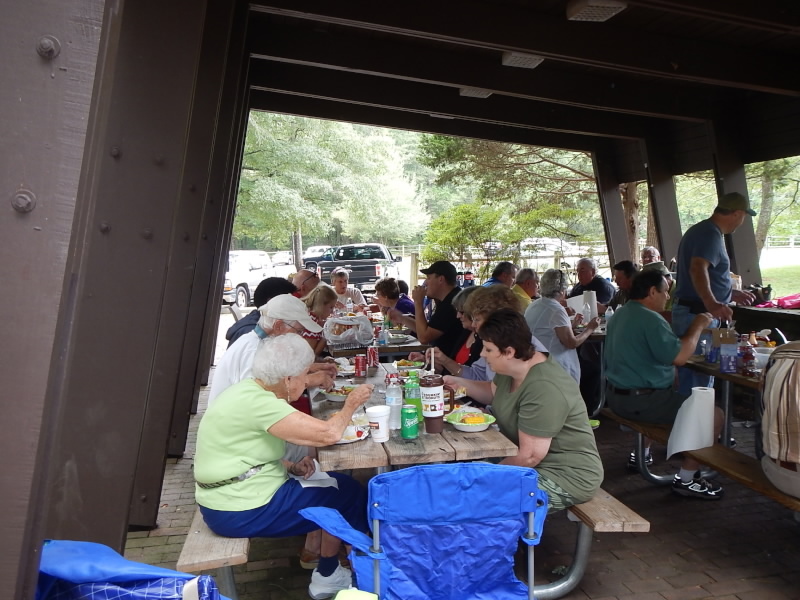 We had planned to meet for lunch at the trailhead parking lot where we met up in the morning, but with the perfect weather the lot was full of cars and hikers. So we moved to the old church to eat our lunch. All in all we had a great time, with great weather and great camaraderie. 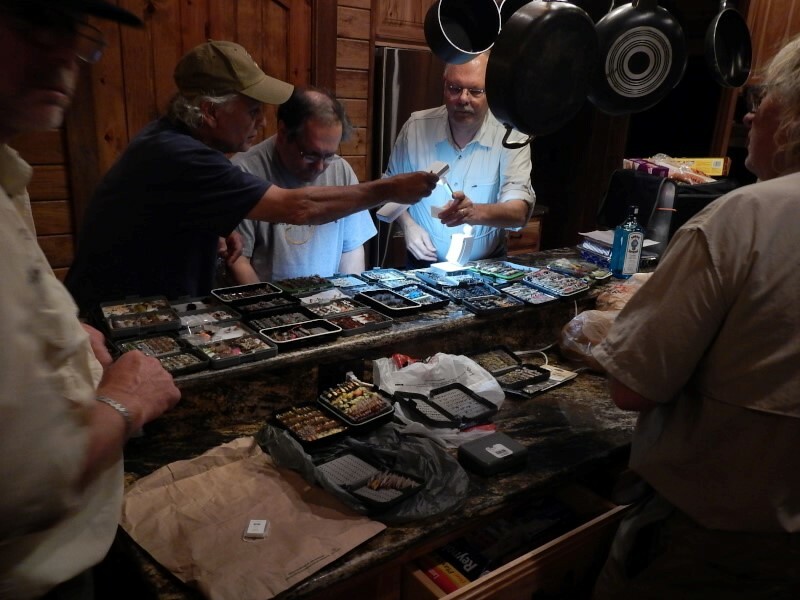 There were four CFFC members that attended an outing hosted by Dale Collins and Bobby Bennett of the Tuckaseegee Fly Shop in Bryson City, NC. Attending from CFFC were Rick Meeks, Tony Aldridge, Jack Costa and Jim Mackey. 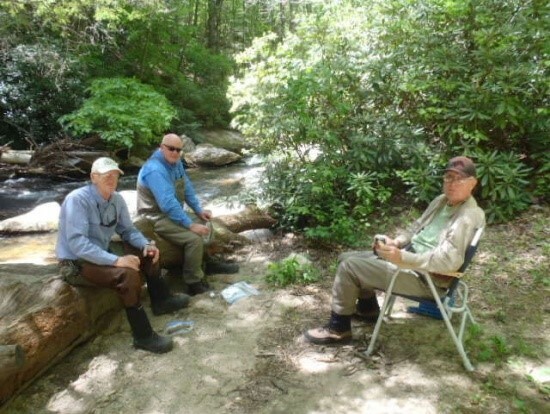 This group was joined by two other gentlemen, Jonathan from Knoxville, TN and Jim from Salisbury, NC. 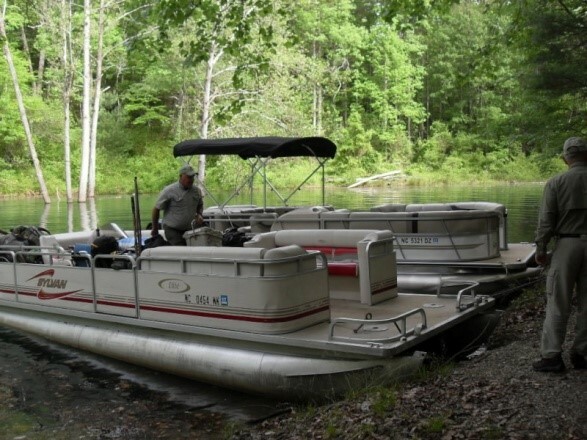 It was a 20 minute boat ride to the old grownup Proctor ball field where we camped for three nights and four days. The outfitter was Steve and Becky Claxton so you really couldn’t say we were roughing it very much. 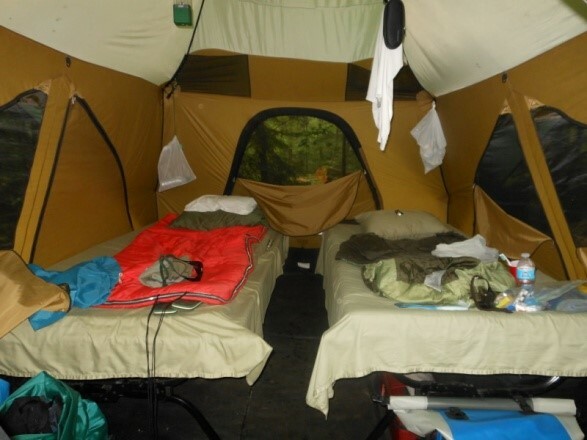 The meals were ten stars plus, accommodations were great…two to a tent with cots and four inch foam pads with clean sheets and pillow, and to our surprise there was a hot shower. The bathroom facility was a tree and a shovel with all the toilet paper you could use. One had to be a little careful as there was a bunker crop of poison ivy in the woods and many hot spots where others had gone before. 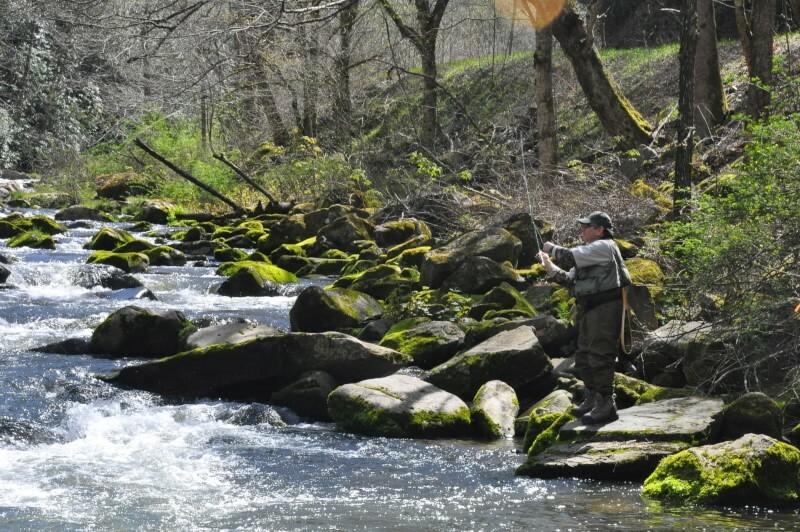 Steve said that Hazel Creek was running low for this time of year but we surely wouldn’t have wanted it running any fuller than it was. Some of us fished Thursday afternoon with little luck. Friday four of us had arranged for a guided outing so we hiked in about two miles. We all caught some fish but the catching was very slow. 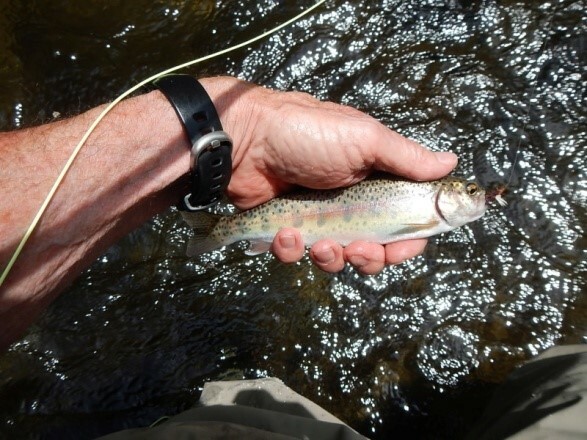 I caught a brook, a rainbow and two Smoky Mountain cutthroats (what a pretty little fish). Browns were also caught by the other guys. The four of us caught four to seven fish each. Jack Costa and I fished Saturday morning and caught a couple of rainbows each. Most were running in the 8-10” and Jack had one that would have gone 12” or so. Saturdays catch was caught right behind our camping area. Several fished Sunday morning but had no luck. We were quite lucky with the weather as the weather guessers were calling for 50-80% chance of rain Friday and Saturday. All we had was some light showers Sunday morning which had subsided by the time we headed back to reality. 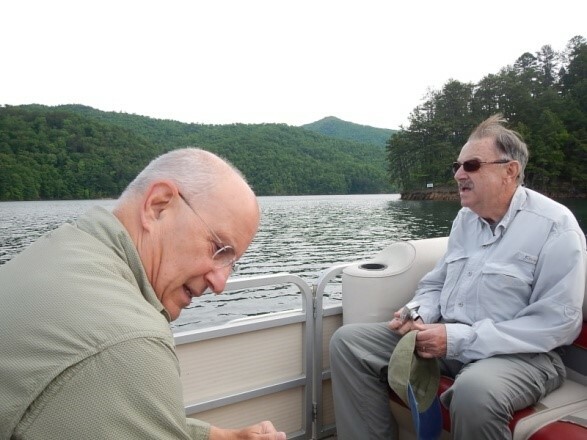 Everyone was a little disappointed with the numbers of fish caught and our two guides from Tuckaseegee Fly Shop, Dale and Bobby were frustrated as well. They both put forth a very strong effort to catch fish that were reluctant to bite. And that’s why it is called “fishing”. We all had a fantastic time. 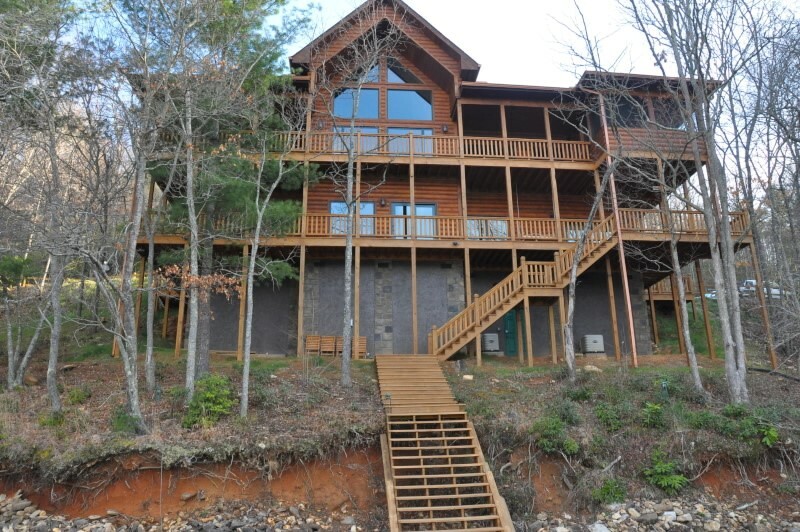 Steve and Becky Claxton worked their tails off and were extremely accommodating. 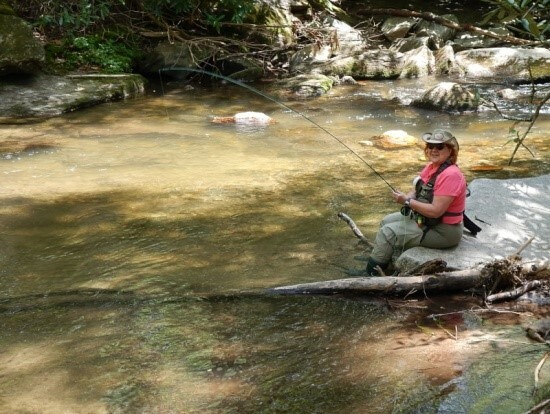 I would highly recommend Steve and Becky Claxton and Dale and Bobby to anyone that wanted to go to Hazel Creek and fish. 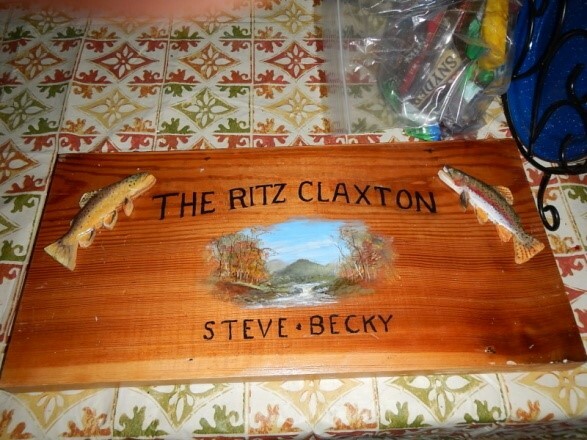 To visit Steve Claxton’s web site go to steveclaxton.com and for Tuckaseegee Fly Shop go to www.tuckflyshop.com. 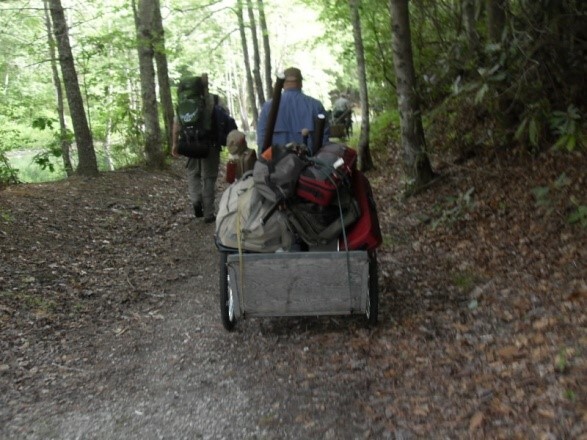 We all arrived Thursday evening after braving the freshly graded two mile dirt road into The Lazy Bear Lodge. 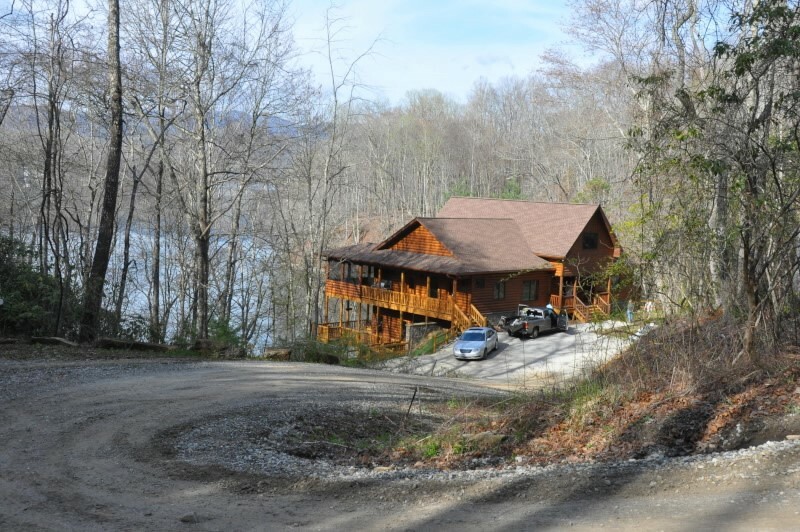 The lodge was a rustic three story log type structure overlooking a picturesque Nantahala Lake. Inside was as equally exciting with high ceilings, granite counters in kitchen and all bathrooms, wood flooring and furniture to match. All was very clean and inviting. 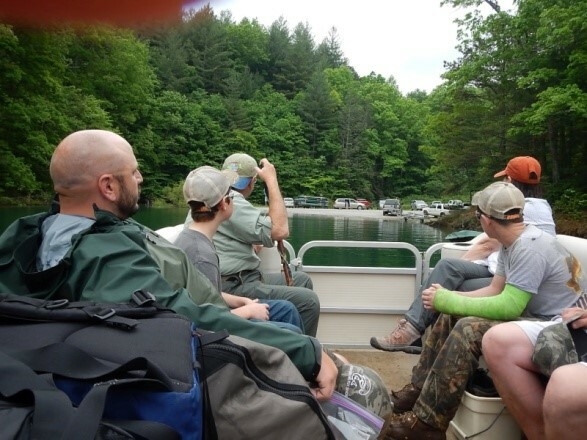 Some of us fished the Nantahala River Thursday afternoon with expectations of strong storms and nasty weather in the forecast for Friday. We all woke up to low ceilings, fog and rain. Todd Basinger was kind enough to provide eggs, sausage and fresh biscuits and coffee for the morning weather watch. We all hovered around our cell phones and computers watching the weather radar for a break which, came around 11:00 am. By noon everyone trekked down the now muddy two mile road to hard pavement. I think we all picked up 100 pounds of mud on our cars on our way out. But we all made out and on the river. 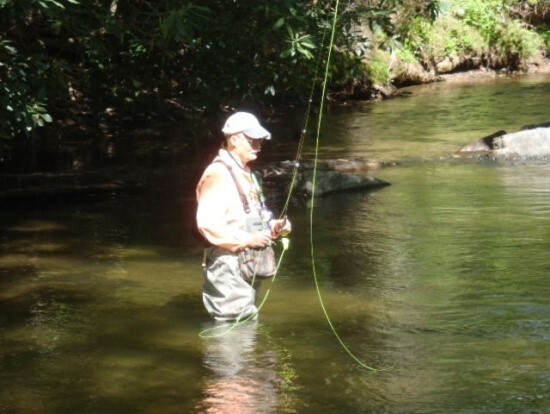 The water was a little high and slightly colored but otherwise very fishable. I managed to run around in the morning getting pictures of everyone fishing but unfortunately I wasn’t in place to see fish being caught. I think they must have been a little camera shy…the fish that is! 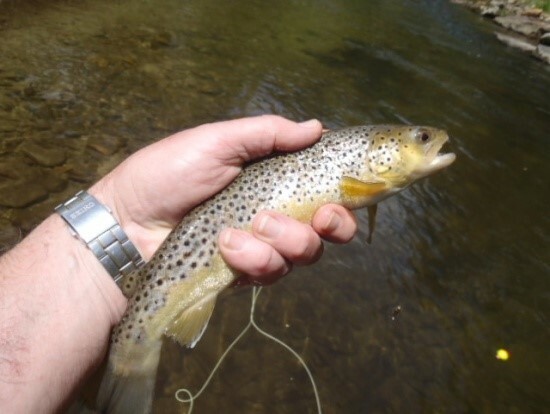 I had several reports that ten minutes after leaving they caught the big 18” browns and bows. We all woke up Saturday to Carolina blue skies and 44 degrees. 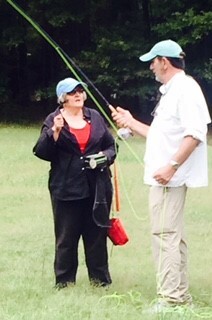 After another hardy breakfast we all headed out to fish and we all did reasonably well. Once again the fish ended up being camera shy however, we did get some pictures of netted fish just to prove we weren’t telling fish stories. The afternoon turned out to be a perfect spring day with temps in the low 70’s. Sunday morning everyone pitched in by taking linens off beds and taking them and dirty towels to the washing machine, c leaned up all the trash and made 10 rounds checking to make sure all was gotten out of drawers and the like. 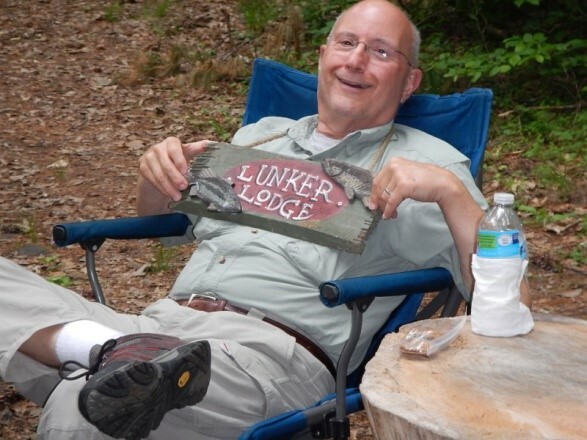 Everyone was headed home by 10:00 am except for one avid fisherman, Rick Barber who stayed to fish his favorite hole on the Tuck. I haven’t gotten a report on how he did. All and all it was a fantastic trip. 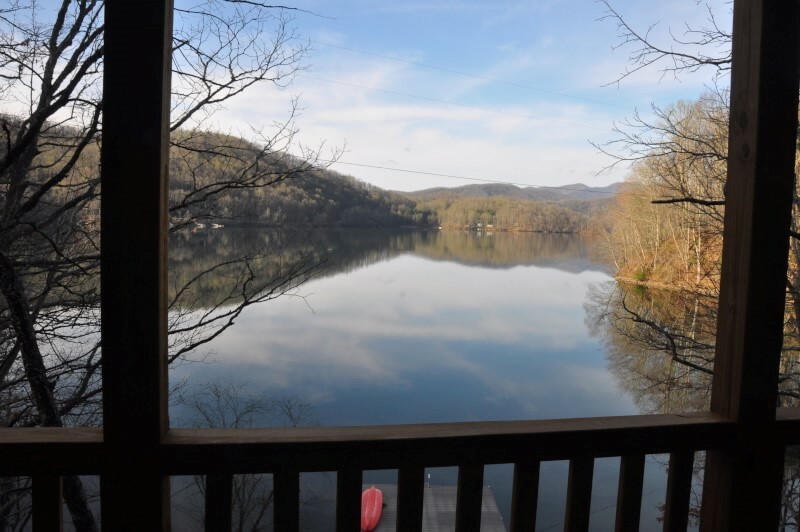 The house was newish, clean and something we all dream about which was overlooking a very picturesque setting on Nantahala Lake. 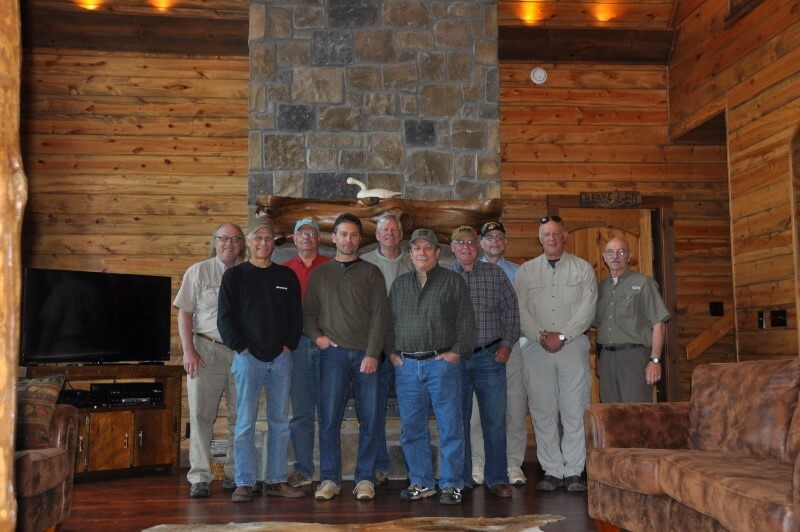 Attendees were: Rick Barber, Todd Basinger, Greg Clements, Sam Henderson, Dan Hebert, John Leum, Jim Mackey, Chris and Linda Sauer, John Tumino, Dennis West.